For some, these words serve as a reminder to honor branches of the United States’ Army, Marine Corps, Navy, Air Force, and Coast Guard. For one gathering of DeKalb County School District (DCSD) students and community members on November 9, the words serve as much more. They serve as an ethos, an ideal, and an unwavering virtue. Hundreds of cadets from DCSD’s high school Junior Reserve Officer Training Corps (JROTC) gathered at the Robert R. Freeman Administrative & Instructional Complex on November 9 to celebrate Veteran’s Day 2018. 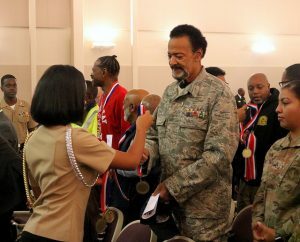 The event featured remarks from DCSD administrators, student performances, the presentation of medals to attending veterans, as well as guest speaker Anthony C. Aiken, Sr., a retired United States Army Colonel. Dr. Green pledged to never take for granted what serving in the United States military means, and honor that service all year. “Our appreciation does not go without sincerity. I’m proud to see our young people step into the ranks and prepare themselves. The world favors prepared individuals,” Dr. Green said. According to Dr. Green, more than 1,700 students are involved in DCSD’s various JROTC programs. More than 80 students from the 2018-2019 graduating class plan to join the armed forces. “We are doing our part and we will continue to do our part to support and accentuate the pipeline of those who join the military and stand with the proper honor to preserve and protect our nation,” said Dr. Green. 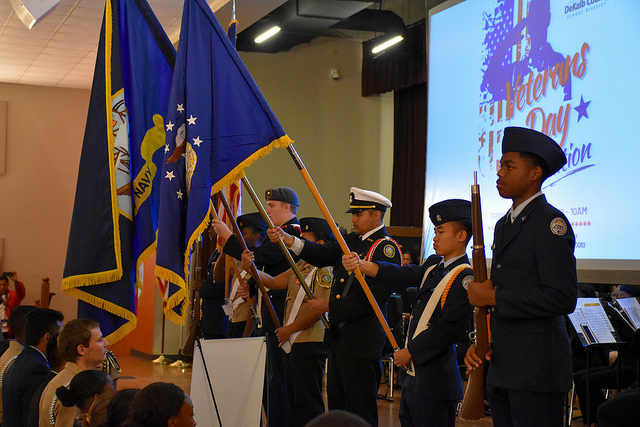 According to Dr. Delmas Watkins, Career, Technical & Agricultural Education director at DCSD and veteran, 19 district JROTC units united on November 9 to celebrate United States veterans worldwide. Dr. Watkins also took the opportunity to recognize five retiring JROTC instructors: Arabia Mountain High’s Raymond Stafford; Columbia High School’s Joseph Guillory; Southwest DeKalb High’s Leroy Washington; Druid Hills High School’s Calvin Pauling; and Southwest DeKalb High School’s James Ferguson. Cadets from Tucker High School’s Air Force JROTC, Chamblee Charter High School’s Army JROTC, and Druid Hills High School’s Navy JROTC programs all demonstrated drill exercises following Green’s remarks. The students showcased their talents in coordinated marching, step routines, rifle handling, and sabre handling. The performances were followed by a performance of the five branch service songs by the Southwest DeKalb High School band. Veterans stood as each song was played, and each was met with applause as well as a medal from DCSD cadets. The event was concluded by guest speaker Anthony C. Aiken, a retired United States Army Colonel. Cadet Paul Joiganant of Dunwoody High School introduced Aiken, a Charleston, SC native who has served in operations around the world. Aiken imparted words of wisdom involving leadership, excellence, defying expectations, and his own military service that he hoped will impact those gathered.